It's a windy Sunday morning in April and cars are speeding past a nondescript patch of land near the foot of the Key Bridge. The patch of land even has a name—Rosslyn Circle—but probably few know it or could direct you to it if asked. On this morning, the once-neglected circle is alive in every sense of the word: More than 100 children, parents, neighborhood residents, local officials, Tree Stewards and National Park Service staff are gathered here to beautify the space and memorialize loved ones by planting 32 trees. Their unexpected and serendipitous partnership was facilitated by the Rosslyn Business Improvement District (BID). It all started with an email that Monica Tierney, program manager at Children's International School (CIS), sent to the Rosslyn BID a few days before Christmas last year. CIS is a local preschool founded by her mother, Beatrice Tierney Stradling, in 1985 to provide children from multicultural backgrounds with a quality learning environment grounded in the Reggio Emilia educational approach. In keeping with this philosophy, the curriculum at CIS is often child-directed. "This past month we are teaching our children about philanthropy and giving back to our community," Monica Tierney wrote. "They voted to help build a playground for other children. They created calendars and with the money raised, we hope to donate toward a local playground. Is your organization working on any current improvement playground/park projects?" Maureen Goldman, communications director at the Rosslyn BID, responded. There weren't any playgrounds being updated in the near future, she wrote, but she did know of a Rosslyn resident and local Tree Steward, Naomi Peña, who was working with Colin Davis, a natural resource specialist for the National Park Service, to beautify an area next to the Key Bridge. Davis and George Washington Memorial Parkway staff, with help from Peña and the Tree Stewards, had just cleared the land and were now trying to raise funds to plant trees. Was Tierney interested in partnering on that? She was, and so the Rosslyn BID put Monica Tierney and Peña in contact. After they spoke and discussed the project's most pressing needs, Tierney reached out to parents from CIS's four locations (three in Arlington and one in Alexandria) to explain the project and ask for support. They agreed CIS parents and children would raise funds to purchase the trees and later come to Rosslyn Circle to help plant them. The preschool hoped to raise $2,500; they ended up collecting more than double that amount. 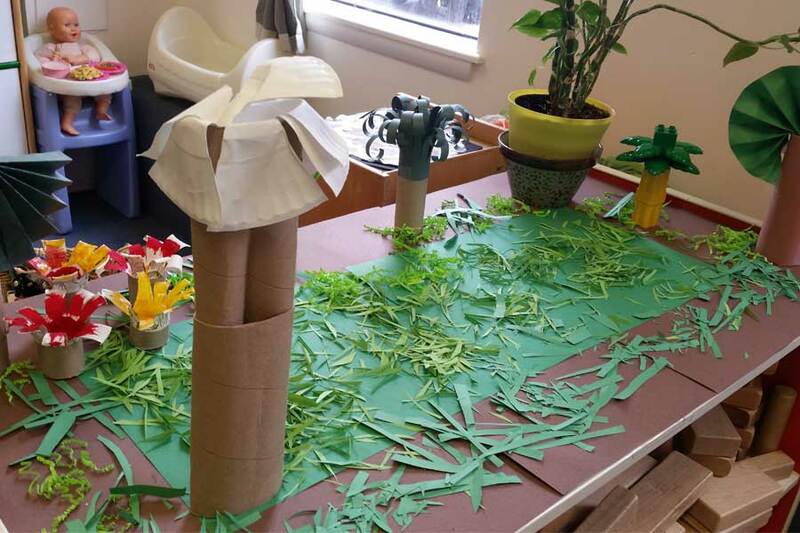 "Documenting children's thoughts is a very important part of the Reggio Emilia approach," Monica Tierney explains. "That's how they learn—by going back to what they said about a topic previously." Arlington County Board Chair Katie Cristol is on hand to help plant. She's happy and excited to be here. "Do you realize it's Arbor Day weekend?" she says. "It's so fitting that here in Arlington we're thinking about protecting our trees and are also planting new ones. I think it's wonderful that our littlest residents care about trees in our community." After Cristol and several others offer brief remarks, it's time to get dirty (something that makes most of the preschoolers very happy!). Tiny shovels wait for them next to larger ones for their parents and other adults. Teams young and old gather around deep holes soon to be filled with saplings. They are planting native species: tulip poplars, willow oaks, red oaks and dogwoods. Tree Steward Kate Donohue works with Laura Knudtson, her husband Mike, and daughter Maya, 4, and son Reid, 3, who are both enrolled at CIS in Courthouse. Reid and his mom carefully fill the outer edge of the hole with dirt to prepare it for the tree. Meanwhile, Maya and her dad have found a worm, and this is proving more interesting than digging. Donohue lifts the tree from its pot, presenting the family with a twisted network of roots that is packed tightly in the soil. She summons the children closer. "Do you see the roots?" she asks. "Do you want to rub them?" "You can rub them for luck," she says. "This part of the tree is the flare," she adds, pointing to the base of the tiny trunk. "It needs to be level when we plant. We don't want to bury that." Together, they lower the tree—a small dogwood that is already flowering—into the hole and finish filling in around it. "We spend a lot of time outside," she says. "We go hiking and camping and enjoy gardening, so our kids are growing up around these things. We thought this would be a fun activity." Another parent, Katy Suellentrop, is here with her sons, Connor, 3, and Liam, 5. Connor also attends CIS in Courthouse. "I ride my bike by here every day, so I was excited they were cleaning it up," Suellentrop says. "This is such a cool community event. It will be beautiful." 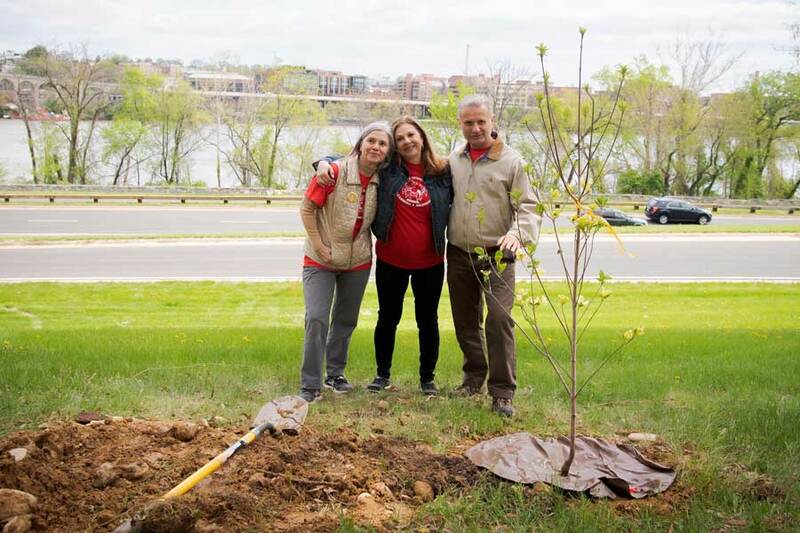 Farther down the hill, in a secluded spot overlooking the Potomac, Ilona and Attila Lantos (pictured below with Beatrice Tierney Stradling) plant a tree in memory of their son, Chris, a CIS alum who died of leukemia in 2013 when he was 12. The family started a charitable foundation in his memory, the Chris Lantos Foundation, which provides iPads to children undergoing chemo. They have remained close to the school community and to CIS founder Beatrice, who purchased the tree for them to honor Chris' memory. "Chris was a Boy Scout, and he loved nature," says his dad, Atilla. "Since he died, my wife and I try to live life in a dignified way, helping others. It's the only way we can get by." It's evident that maintaining a connection with her students and their families is important to Stradling. Throughout the event, she's highly engaged, chatting with parents, helping with planting and sharing stories about the school. She's proud of this community she's built. The planting goes on in earnest for a few hours, with kids and parents getting plenty of fresh air and exercise. The Tree Stewards work closely with families to ensure proper planting. Tree Stewards is a volunteer-based organization with nearly 80 members throughout Arlington, Alexandria and Falls Church. Their mission is to to enhance a sustainable urban forest in the community through volunteer activities and public education programs. Volunteers undergo training and must complete 30 hours of service to become Tree Stewards. The organization is now accepting volunteers for the 2018 fall session. "This project has been so important to the Tree Stewards," says Jo Allen, Tree Stewards vice president for communications. "We've planted more than 100 trees in Arlington and Alexandria this spring, but this has been our most visible project. We're thrilled to partner with NPS and Children's International School." Tree Steward Peña, who is a resident of Rosslyn's River Place, agrees. She's been very engaged with the project and had been at Rosslyn Circle three afternoons during the preceding week to get the area ready. It's only lunchtime but she's ready to go. "I'm wiped out," she declares, but she's still smiling. She's happy that her efforts to beautify her neighborhood have paid off. After the last tree has been planted and the last slice of pizza consumed, the families depart. Colin Davis of NPS lingers to clean up and complete a first watering of the new trees. He's also been instrumental to this project—both in preparing the space and ensuring that the plantings are in keeping with the NPS cultural landscape. Together with the Tree Stewards and other NPS staff, he will now help maintain the new trees and make sure they thrive. All the trees will be mulched and given a second watering within the next few days. After that, they will need regular watering and pruning of invasive plants, such as English ivy and bush honeysuckle. The tulip poplars will grow the fastest, he says, while the willow oaks will grow more slowly. The flowering dogwoods will add color. He looks up at two enormous trees currently standing in the space. They're decades old, and while they're healthy now, it's expected that eventually these new plantings will take their place: the old making way for the new, everything part of the process of life. He's tired but happy, looking forward to watching them grow. Trees—like the children who planted them—have made this small corner of our community a little bit better. And that alone seems reason enough to celebrate. Photo at top: Tree Steward Kate Donohue and a Children's International School family plant a dogwood.